Bright and vibrant, this is the perfect guide for little ones to take with them on marketing day to inspire literacy and healthy eating. Michelle Schaub's poems have appeared in several anthologies and magazines. She is the author of This and That Sports and Vehicles of WWI (Capstone Press). Michelle lives in Downers Grove, Illinois. Amy Huntington illustrated Grandma Drove the Garbage Truck, Grandma Drove the Snowplow, and Grandma Drove the Lobsterboat (Down East Books) among others. Amy lives in Williston, Vermont. ♦ A multiethnic crowd of people saunter through a farmers’ market, investigating produce, accompanied by cheerful poetry. Does the “smell of a melon give clues you can use”? Are free-range eggs truly “eggs-traordinary,” and is honey really “liquid-gold alchemy”? Along with this delectable sampling of sweet corn and the search for gooseberries are a list of reasons to shop at such a market, from “Tempting Your Taste Buds” to “Befriending a Farmer.” Huntington’s light watercolor brushstrokes provide a pleasing window into the world of the farmers’ market, from the early morning unloading of the truck to packing up in the late afternoon. Pair this delightful visit with Grace Lin’s mix of science and haiku in Our Food: A Healthy Serving of Science and Poems and Gail Gibbons’s exuberant The Vegetables We Eat for a nicely balanced diet. VERDICT When “a line wraps around the corner for fresh-squeezed lemonade” and the “farmers mist the Swiss chard and themselves,” you know you’re in the right place. Yes! Creating a casual, summery vibe, this attractive book presents a chronological series of short poems describing a farmers’ market. Before dawn, farmers load their trucks and drive toward town. At daybreak, they set up their tents and tables. Soon the market buzzes with people talking and dogs chasing around the stands. Besides the usual produce, shoppers find honey, eggs, baked goods, a knife sharpener, a face painter, and dress-up costumes for kids. Schaub handles rhythm and rhyme with a light, sure touch. Individual poems feature topics such as the selling of sweet corn, the music of fiddle and banjo, and the need for dirt. Created with watercolor, graphite, ink, and digital elements, the illustrations suggest the happy chaos of a busy marketplace in a racially diverse community. Recurring characters, both people and dogs, can be found in many scenes as they observe and interact with one another. As fully illustrated as a picture book, this cheerful collection of verse offers an enticing introduction to farmers’ markets. 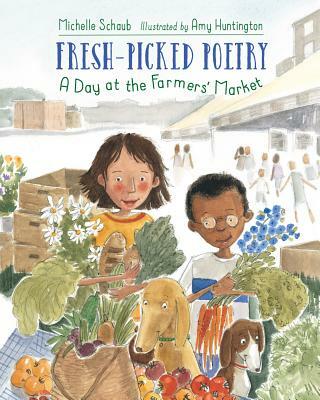 In her first picture book, poet Schaub celebrates farmers' markets in 18 buoyant, mostly rhymed poems; readers can follow two children and their respective dogs through one such market in Huntington's (Grandma Drove the Lobsterboat) airy watercolors. The poems sing praises of the edibles on sale at the market, as well its sights and entertainment. "Get your roasted sweet corn here!/can't beat this time-of-year!" reads "Sally's Sweet Corn," while "Delightful Bites" highlights the market's delicious smells: "Alluring aromas float over tent-tops—a whiff of vanilla, a whisper of spice." Occasional moments of excitement (one of the dogs makes a beeline for a table of free fruit samples) capture the bustling energy of an outdoor market. A collection of poems celebrates farmers markets. Beginning with "Market Day Today," Schaub encourages readers to "spy the wonders / on display" where "farmers chat" and "musicians play." In "Early Risers," farmers "harvest, sort, / wash, and load" produce at dawn, and in "Transformed," they convert city spaces into "tasty transformations." "Pile Up" describes brown-skinned Farmer Rick meticulously stacking cauliflowers, peppers, beets, and peas in "perfect symmetry," while "Is It Ripe" offers clues on testing cherries, peaches, melons, and apricots. Other poems extol the scrumptious scent of freshly baked goods, the twang and rattle of market music, the "ear to ear" joy of sweet corn, honey's "liquid-gold alchemy," and "eggs-traordinary" free-range eggs. Empty produce crates and brimming cupboards offer closure in "Day's End." Humorous, detail-rich, fresh-toned water-color, graphite, ink, and Photoshop illustrations introduce a brown-skinned farm boy, a white city girl, and their respective dogs, who provide a diverting visual subtext as they explore the market while chasing their rambunctious pets across double-page spreads. "Fresh-Picked Reasons to Spend a Day at the Market" offers useful data on farmers markets. Sprightly illustrations and engaging rhymes will leave readers eager to sample market bounty.